I hate to pick on the good folks at TextPlus, because I like the service (and my kids do too). But my family recently had an experience that reminded me how stunted the advertising ecosystem remains in the (relatively) new world of apps. Quite serendipitously, after that experience I had the pleasure of meeting the CEO of Gogii, the company behind TextPlus. More on what I learned from him in a moment. But first, to the problem. TextPlus is a star in what I’ve come to call “AppWorld,” that Jobsian funhouse mirror universe of apps (TextPlus also on Android, where I’m told it’s growing faster than in iOS). Parent company Gogii is backed by Very Serious Venture Capitalists like Kleiner Perkins and Matrix Partners. Clearly, this is a horse that smart money is backing. 1. Every app maker I have spoken to tells me that they mostly rely on third party ad networks. They then complain that those networks “don’t understand our business” and are not aligned with their core interests. These networks provide limited visibility into future revenues, and the ads they deliver are rarely if ever targeted well. 2. These third party ad networks sometimes pay well, but most of the time, they pay very poorly. If an app is going to make it, they have to depend on Apple’s iTunes store and iAds (which brings with it its own set of gordian policy and business strategy issues) or on their own sales force, which is difficult, as most apps don’t have the scale to build and execute salable ad products. 3. Bad actors and practices often creep into how networks execute campaigns on third party apps. Which brings me to my experience with TextPlus. I recently helped my daughter set up her TextPlus account. We downloaded and configured the free version (you can buy an ad-free version for a few bucks, more on that later). After about three minutes, my daughter was happily texting my mobile number. It was a cool experience – my daughter doesn’t have a “real phone” yet, but now she can text me just like her older siblings. She proudly held her iPod Touch up to show me her latest text, then asked me why my phone number didn’t have a name like “Dad.” I thought about it for a second and realized she hadn’t set up any Apple contacts yet. 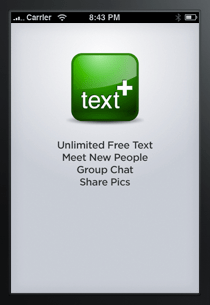 So I opened the Contacts app, put myself in there, and reloaded TextPlus. Sure enough, there was “Dad” in the text stream. My daughter was radiant. As I was about to hand the iPod back to her, however, the entire screen was taken over by an ad for Cadillac. That was bad enough, but to make matters worse, I couldn’t figure out a way to make the ad go away. I had to wait for 15 seconds or so, till the ad cleared. The moment of delight between my daughter and I was ruined (my unscripted burst of expletives probably didn’t help). 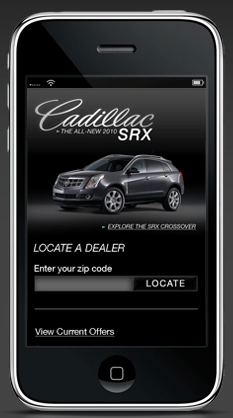 In those 15 seconds, my opinion of both Cadillac and TextPlus dropped precipitously. It wasn’t the actual ad – the creative was pretty good in fact (the image at left is not what I saw, but I didn’t manage to get a screengrab). What angered me was the interruption and the lack of fit – why on earth would Cadillac push an ad to a girl who couldn’t even drive yet? Given I am pretty deep in this industry and aware of the points I made above, I figured it was entirely possible that both Gogii and Cadillac had no idea this experience was happening to me. Turns out, I was right. And therein lies one of the big problems (and opportunities) in the mobile advertising world. Rather than bang out a post about how terrible my experience was (I was tempted), I lobbed a call into Gogii to ask if perhaps the ad was a mistake. Over the years at FM, I have had enough experience with similar issues in the HTML web to know it was certainly possible. As it happened, the CEO of Gogii (based in LA), was in San Francisco the next day. We set a meeting. Scott Lahman is a mobile and gaming veteran, having held senior positions at Activision, EA, JamDat, and now as founder of Gogii. He came by the FM offices and within a few minutes we cleared up the Cadillac ad question – a third party network had “snuck” the ad past TextPlus’s filters. Lahman hates when that happens, but … it happens. He was aware of it (other customers had complained) and he had already addressed the problem. With that settled, we could dig into the bigger issues of the mobile advertising landscape, from the point of view of a Serious App Maker like Gogii. Gogii has more than 25 million downloads, a very engaged and attractive base of customers (millions of teens), and has begun to build out a content driven social element to its service. It also has some big things planned that I’m not allowed to talk about yet. While Gogii sells an ad-free version of its app, its future is deeply tied to advertising. This initially seems counter intuitive given you can buy your way out of ads on TextPlus for a few bucks – for life. That’s a pretty low estimate of the lifetime value of a customer. Clearly, something else is going on. At the moment, Gogii has one product that it sells at a premium – essentially a home page skin – but it makes the rest of its revenue from the networks. Given all that, I wondered how Lanham felt about the three points I made earlier in this piece. In short, Lanham told me, the mobile advertising industry is about five years behind the HTML web in just about every way. Which is interesting when you think about what was going on in web advertising back in 2006. Back then, FM was one years old, but our model was gathering steam. Successful websites (the TextPluses of the world) were growing like crazy, but struggling with poor ad network revenue streams. There was a glut of inventory in both traditional media sites as well as “the Independent Web” – sites like Boing Boing, Dooce, NotCot, etc. – but there was no scaleable way to bring truly engaged marketing into the picture. Of course, since then the FM model and many like it have evolved to bring real revenue and relationships to the ecosystem. We’re not where we want to be, of course, but we’ve come a long way. But at the same time as this progress was beginning, that same glut of inventory was feeding a new set of players – the second-generation ad networks. It was about five years ago that those networks were snapped up in a frenzy of M&A. AOL already had purchased Advertising.com. Google bought DoubleClick (and its nascent exchange business). Yahoo bought Right Media. Microsoft bought AdECN. There was a lot of froth in the marketplace, as the major players realized Internet advertising was ripe for consolidation and new business models. Since then, we’ve seen the rise of exchanges, demand side platforms, and programmatic buying. We’ve also witnessed the attendant response from the publishing world – supply side platforms like Lijit, hand wringing from premium publishers like ESPN, and innovations in ad products like conversation targeting, which can’t be bought on exchanges (at least, not yet.) We’ve seen online advertising split into two large buckets: “Unsold” or remnant inventory, where the networks mainly play, and “premium,” where publishers (or their partners) create more engaging executions that resonate for brands. Put another way, a lot has happened in the non-mobile web, and it’s all about to happen again, but faster, in the mobile web. There’ll be a lot of consolidation (the firing shots were, of course, AdMob/Google and Quattro/Apple), there’ll be engaging new products (think really new) that scale across federations of quality apps like TextPlus, and there will be new technology solutions that will, more likely than not, be snapped up for prices that don’t seem to make a ton of sense. Which is all a long way of saying that I think things are about to get far more interesting in mobile advertising, in particular for apps that comprise “the Independent Web” of the mobile world. It’s about time. In a future post I hope to delve into some of the architecture, data, and business model issues that will need to be addressed if we really want to see a truly independent world of apps thrive. I for one certainly do. This is really informative J. I’m still waiting to see how mobile advertising will play out in the long run. For someone who still uses business cards, it may mean nothing, I’d still like to be able to see my prospects. I think we need to redefine “mobile.” there’s the independent web of services and apps, and then there’s publishing services like Flipboard, and individual publishers like the Times, who are killing it in “mobile” mainly, at present, in the iOS environment. and within mobile there is still a gulf between phone and tablet advertising, in terms of inventory, targeting, adaptability to the platform and device experience. with the pace of advancement of apps themselves, especially for tablets, one could reasonably expect the ad service providers to move more quickly and adapt. Pingback: How to make money on mobile, in three easy steps | EMoneyProfits.com - The Money and Finance Hub.